Ok, this post will be quick and to the point as to why you want a water softener for your coach or RV. You know the saying that a picture is worth a thousand words? (Of course you do.) But I just had to say that as that is what people seem to say when they want to show you something. So let me get right to it and just let the photo do the talking. 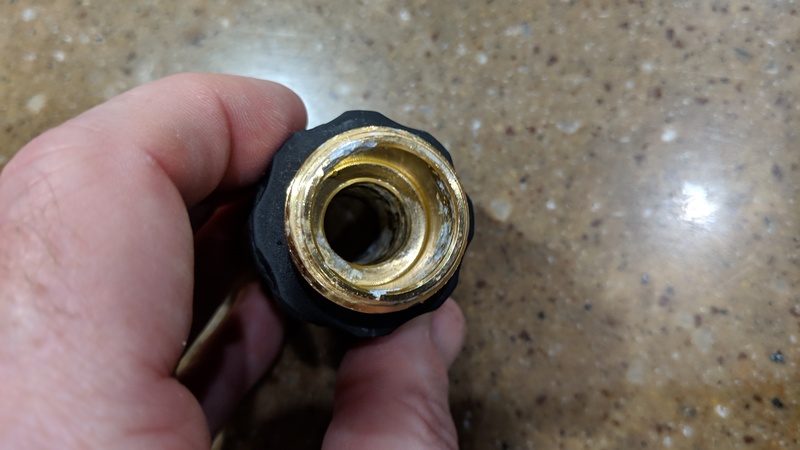 What you are looking at is a “Quick Connect” that I use on our On The Go Water Softener. I was doing some tinkering and removed it to move something and found this! 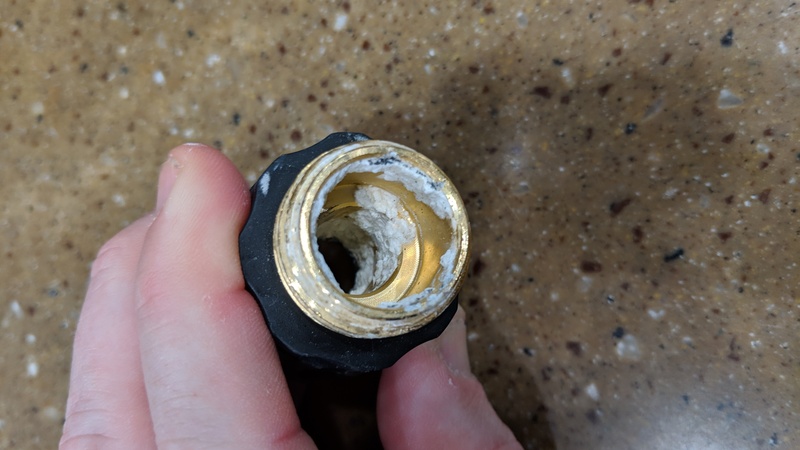 This quick connect is RIGHT BEFORE it goes into the water softener. This connector has been in use for about 2 years if I recall. 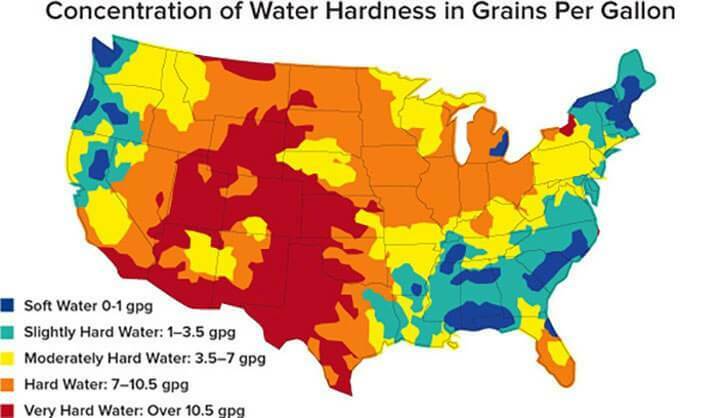 So the water that has been run though it is mostly from Upstate NY, Burleson TX, and Fort McDowell AZ. The water used in AZ this case would be the “hardest” water of the areas we travel. Feel free to click on the image to see it larger if you need to, but you can clearly see the hard deposits that have been building up over time. It does not take long for this to happen especially when you are in areas of very hard water. Now let’s look at the OUT flow quick connect which would be handling the water after it went though the softener. So seeing that I would hate to know what the plumbing connections, taps, etc would be like at this point if we did not use one. We have always had one in our home, and we would always have one in our coach. 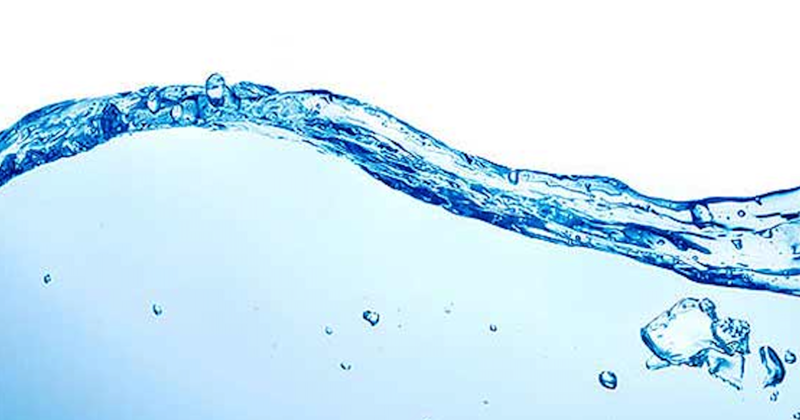 Once you start to use soft water, well, for us, we would never want to be without it. Your clothing is even has a softer feel and you also use less laundry and dishwasher detergent. As you can see below, as you travel, you surely will have different experiences with water. Thanks for providing this great tip! As usual great video. Does the water softener have to be mounted vertically? I don’t have as much space as you have. David: What brand and model number quick disconnects have you been using? I have been using ones that are anodized aluminum, and look brass colored, but they are not. They sell some that are drinking water safe, but not in multi-packs, just separately. The multi-pack ones are reasonably priced, and look exactly the same, and say they are for RV’s,….. but do not go out of there way to say specifically they are drinking water safe. Would appreciate your take on what your using,…..
Hi… It was this one… https://amzn.to/2I8Xkii I never really paid attention to it being marked for drinking water as all of our drinking water get purified. Thanks for the reply David. Those are the same ones that I’m using as well. 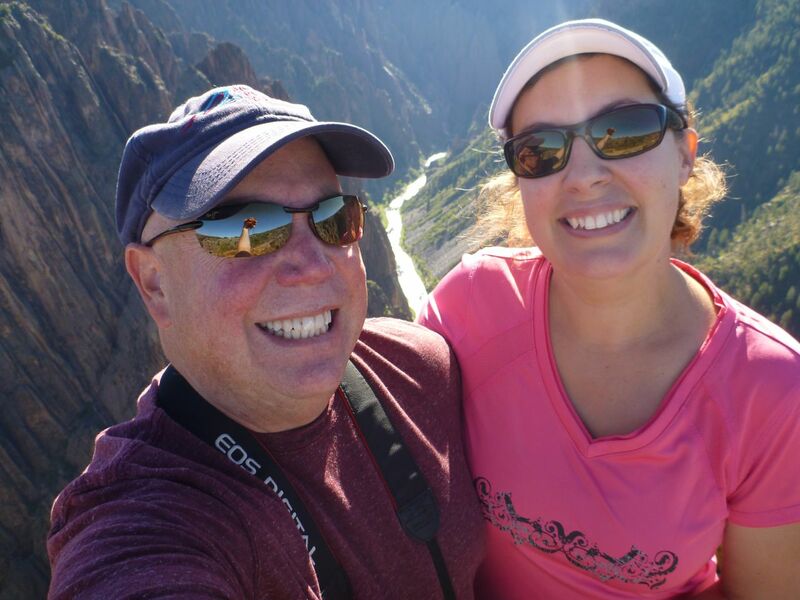 Love them,…but the wife doesn’t like that they don’t say “potable” water use. I wonder if it’s just a repackaging rip-off for guys like me,…..? Not a fan of the 3-D. Like the water softener . I wonder if my really slow kitchen tap in the RV isn’t caused by plugged lines (plugged with mineral deposits). Wonder if there is something we can do (other than cleaning the aerator on it) to clear any deposits out of the lines in our rig. Hi Lisa…I am sorry, I am not sure what may be able to be used to try to clean out the lines just in case. But the cleaning of the aerator is very important for the build up will happen faster with evaporation as the water drys. I don’t know what coach you have, but if it’s like most others it has PEX (“plastic) water lines. PEX lines are highly resistant to calcium buildup. This (along with ease of installation) is a primary reason why home re-pipe jobs are typically done with PEX. Your problem is most likely a plugged aerator at the tap. Soak it in a calcium remover (I’ve used CLR with great success) and you will be back in business. Better to unscrew it from the faucet head, but you can also soak the entire head in the product if necessary.